Self Portrait of Adam Kraft, the Sculptor of St. Lorenz’s Tabernacle. In front of the Frauenkirche. The glockenspiel is right below the blue clockface. Lest you think we came only to eat, drink, and shop in Nürnberg (well okay, so that was our primary objective), we did do some sightseeing. Loads of amazing Gothic sites surround the market, including the fabulously ornate Goldener Brunnen fountain built in 1396 (spin the ring in the gate for good luck), and the brooding Frauenkirche (Our Lady’s Church), which has an enormous, gilded glockenspiel. Every day when the clock strikes noon, the seven princes of the Holy Roman Empire circle around Charles IV, presenting him with emblems of their fiefdoms while the glockenspiel plays — a real showstopper if you can get close enough to get a good view (unfortunately, our video zoom wasn’t up to the task). Various beauties who’ve played the Christkind through the years. 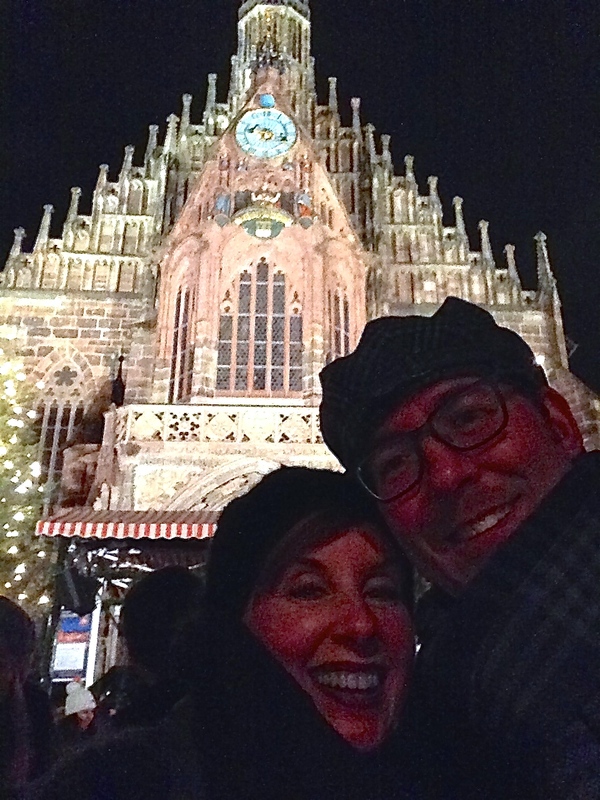 We hiked up to the balcony beneath the glockenspiel for a bird’s-eye perspective on the Christkindlesmarkt, then we toured the small exhibit highlighting all the young lovelies who’d played the part of the Christkind (Christ Child) throughout the history of the fair. 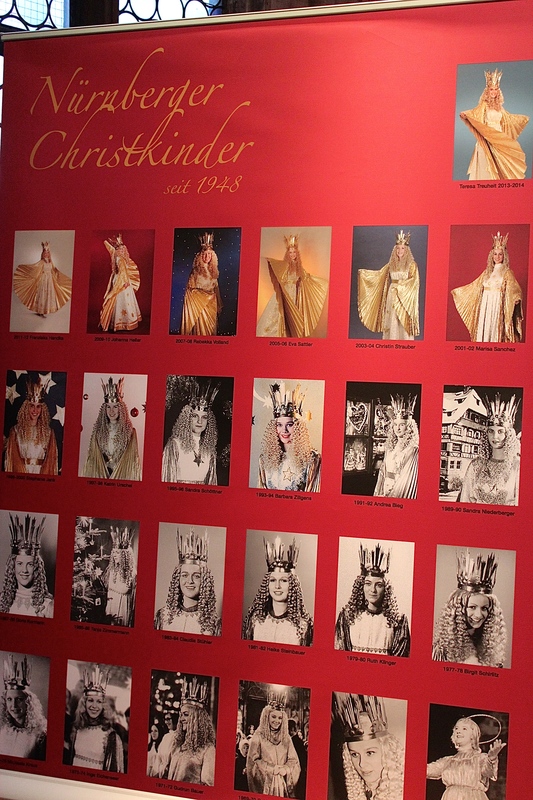 Apparently the first Christkind was an actress who held the part for 30 years and “flew” over her fans via aerial wires. So why does a gorgeous woman play the role of the Christ Child, you might ask? It’s kinda complicated. In the early 1500s, Luther decided that the baby Jesus should be the gift-giver on his birthday, as opposed to the catholic St. Nick. But imagining a tiny baby delivering gifts was a big stretch for the kiddies’ belief systems, so a golden angel was roped into the responsibility. Each year, a contest is held to see which nubile beauty gets the job. She presides at the opening of the market and spends several days visiting with local kids, and then she heads to the U.S. where she reprises her role for Chicago’s large German community at our Christkindle Market. 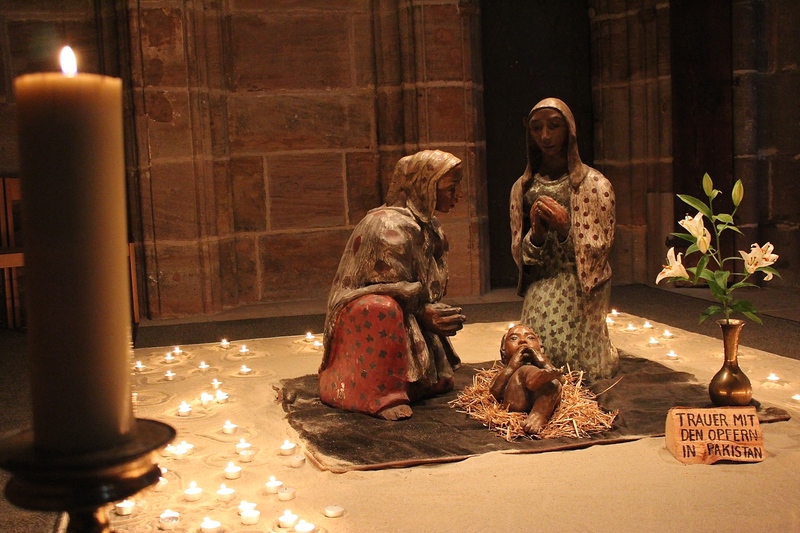 A beautiful nativity set at St. Lorenz’s Church. So after visiting the Christkind’s church, we decided to head on over and see a few more Gothic inspirations. St. Lorenz Church, completed around 1400, contains some spectacular works of Medieval art and three enormous organs, which we were fortunate enough to hear played when we came back later that night for an unbelievable Christmas concert. We sat in chilly pews beneath an enormous advent wreath that faced an altar flanked by two huge Christmas trees, undecorated except for simple strands of lights. When the congregation closed the performance by joining the choir in singing “Silent Night” in German, I thought I’d died and gone to heaven. Can’t possible ask for a more moving Christmas moment. St. Sebaldus’s tomb. Apparently it does contain the 1,000-year-old bones of a man. The next day, we decided we still hadn’t gotten enough Gospel Gothic, so we headed on over to St. Sebaldus, possibly the oldest church in Nürnberg. Completed in the late 1200s, it feels amazingly light and airy inside (or maybe it was just that this was the only time the sun came out.) 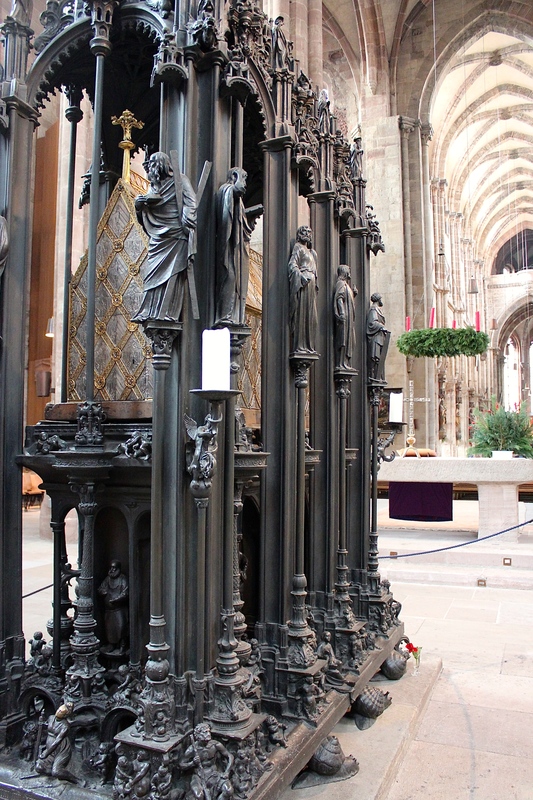 The tomb that holds the relics of St. Sebaldus is gorgeously sinuous and almost sinister, but one of my most favorite things was the nearby series of images telling the story of the destruction and resurrection of the church after WW II. The candlelight vigil around the Medieval city. Black and white photos accompanied by brief prose and poems really capture the devastation to a community, and the loss to humanity at large, when symbols of hope that men have spent centuries building are destroyed in an instant. But the story doesn’t end there. The images and words continue on to highlight the tremendous devotion and tenacity required to recover and rebuild, and how endurance can inspire a rededication to peace. 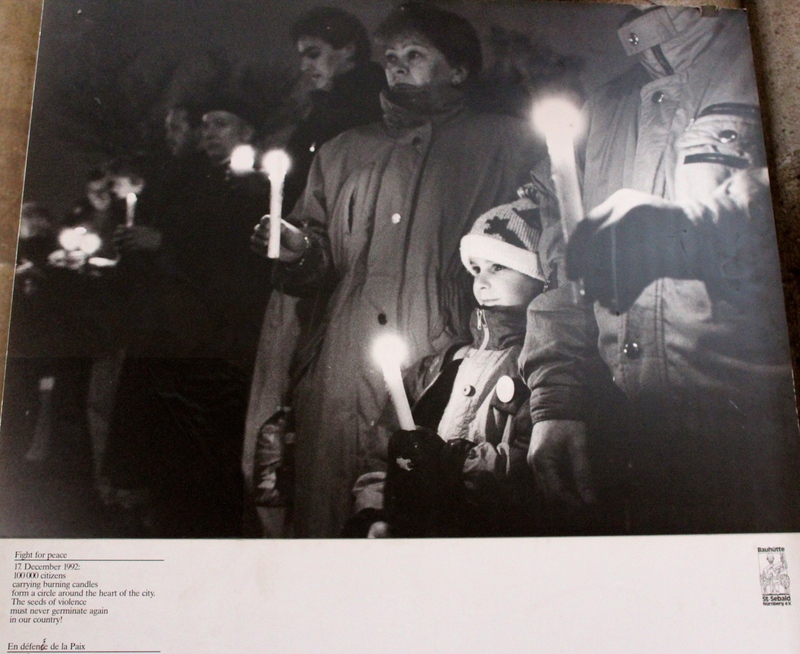 The last image is quite moving, showing the people of Nürnberg in 1992 clasping hands and encircling the Medieval heart of the city in a candlelight-vigil vow never to allow the seeds of violence to germinate in their country again. A pretty powerful promise. In light of the recent anti-immigration rallies popping up in Germany and all over Europe, let’s hope Nürnberg’s citizens remember their pledge and spread the message.